If you are in sales or marketing you have likely noticed some problems facing the industry. Namely, the ever decreasing rates for email engagement. The average email open rates are below 25% and click-through rates (CTRs) are below 4% across all industries. Why is engagement so low? An average office worker receives over 100 emails per day. Because people are receiving so many emails, they have become desensitized. The number of emails being sent every day globally is expected to increase from 200 billion to almost 250 billion by 2021. This means that open and click-through rates will likely decline just based on the fact that people will be receiving more and more emails as time passes. So what is the solution? Luckily there are several strategies to increase email open and CTRs, but one stands above all others. Video. And to be specific, using video for sales. Video is quickly becoming a part of every salesperson’s, marketer’s, and entrepreneur’s toolkit, and for good reason. Here is a list of powerful statistics regarding the use of video in business. These statistics are sourced from Forbes and Hubspot. Who uses video for sales? Almost every major industry has begun to incorporate video. If you can name the company, you can probably assume they are using video. Wondering if incorporating video into your job or business is the right move? As video is becoming increasingly popular and accessible, more and more professions are beginning to make video a part of their process. Salespeople are seeing great success by adopting video into their process. After all, trust is the foundation of sales and conversions, and few things will build trust faster than communicating with video. Salespeople are using video throughout their entire process including prospecting, follow-up, closing, and staying in touch. 87% of digital marketers use video content as part of their business and that number is always increasing. Video content can be delivered at every step of the buyer’s journey to help consumers make more informed decisions, faster. Business Developers and Entrepreneurs are also using video more than ever before. Ease of access to technology and delivery channels make video the best way to get consumers to understand a new or complex idea. Coaches and Trainers are able to more effectively communicate with more clients with the use of video. Virtually any profession where your job involves communicating with people could be improved by the use of video due to the fact that information delivered through video is retained and understood better than other methods of communication. Why use video for sales? There are many reasons to incorporate video into your sales, but here are some of the most significant. The single most important reason would be to make more money. Every other benefit just leads to that result. 1. 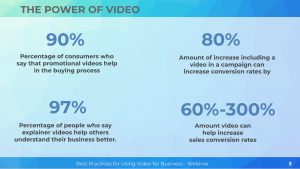 Video dramatically increases sales, conversion rates, and engagement as seen in the statistics mentioned earlier in this post. The evidence is undeniable. More sales and conversions equals more money. 2. Video builds trust and understanding. This is true not only for the brand or company but for the salesperson or individual as well. People are more likely to watch video, and more likely to understand and retain information from video. The better consumers understand and remember your message or brand, the more likely they are to trust in you or your brand. More trust and understanding equals more sales, which equals more money. 3. Search engines like Google, rank video higher than other forms of content. Videos will get your company on page one faster than any other form of content. The better your search engine optimization (SEO), the more traffic your website gets. More traffic equals more money. 4. Video is more shareable than other types of content. Video is shared 1,200% more than both links and text combined. More shares equals more traffic and engagement, which equals… you guessed it! More money! So now that we’ve covered the who and the why, let’s discuss the how. The types of videos to create and how to create them will depend on several factors such as the size and type of the business, budget, and other resources. However, there are some universally accepted guidelines. 1. Personalizing Videos. The more you can personalize your videos the more effective they will be. For companies, this is creating videos that are specific and relatable to their audience or customers. For individuals, such as salespeople and marketers, this often means videos being as personalized as possible. Including things like names and information specific to the prospect will yield the best results. But be aware, there is a line between personalization and efficiency when it comes to using video. 2. Calls-to-Action. Including a call to action is one of the most important parts of creating any video. Your video should have a specific purpose, and it is important to make that purpose clear to anyone watching. 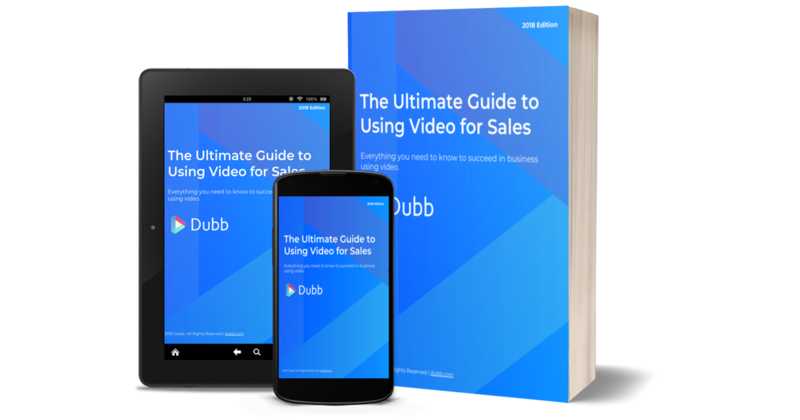 Software services like Dubb provide technology that allows you to easily attach a clickable call to action to videos. 3. Data Reporting/Analytics. Tracking analytics and data reporting is an essential part of utilizing video for business. If you want to see what is working and what is not, keeping track of analytics is absolutely necessary. Having access to your analytics is the first and most important step in being able to effectively interpret your data. If you want to successfully leverage the power of video for your business, tracking analytics is an enormous part of the equation. 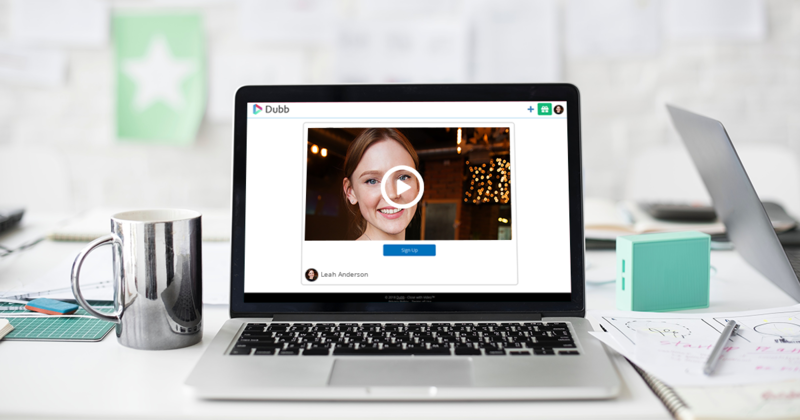 If you’d like to try the Dubb Video Communication Platform two weeks for free, signup here.